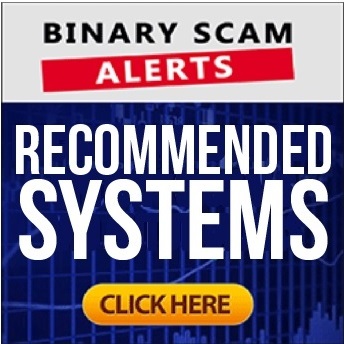 Binary Scam Alerts » Bitcoin Scam Reviews » Bitcoin Millionaire Review, SCAM Bitcoin Millionaire Exposed! 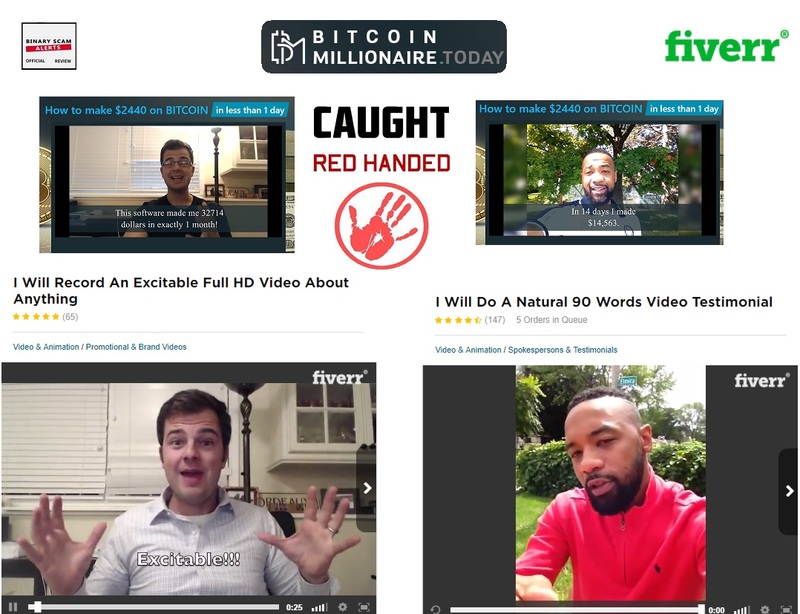 The Bitcoin Millionaire software (unrelated to the Bitcoin Code App) and trading robot by Victor Gray is a filthy SCAM, and we BLACKLISTED it in our detailed and insightful review and investigation. If you are an opportunity seeker looking for a legit and genuine trading app, you should be aware that this system has NOTHING to do with Bitcoin and everything to do with stealing your money. Real money can be made in trading BTC and other cryptocurrencies, and we are actually very much into this form of investment. However, you can’t deposit $250 make a million as advertised here – this is a bona fide get-rich-quick scheme and you are on your way to having your wallet fleeced by greedy affiliate marketers operating in collusion with thieving offshore brokers. Its no surprise the complaints have started to mount as this is an extremely deceptive and misleading piece of technology. The feedback we have received indicates to us we are dealing with con artists who specialize in software manipulation, credit card fraud, and identity theft. In a nutshell, these are shady characters and they are gunning for your cash so make sure you don’t take the bait. 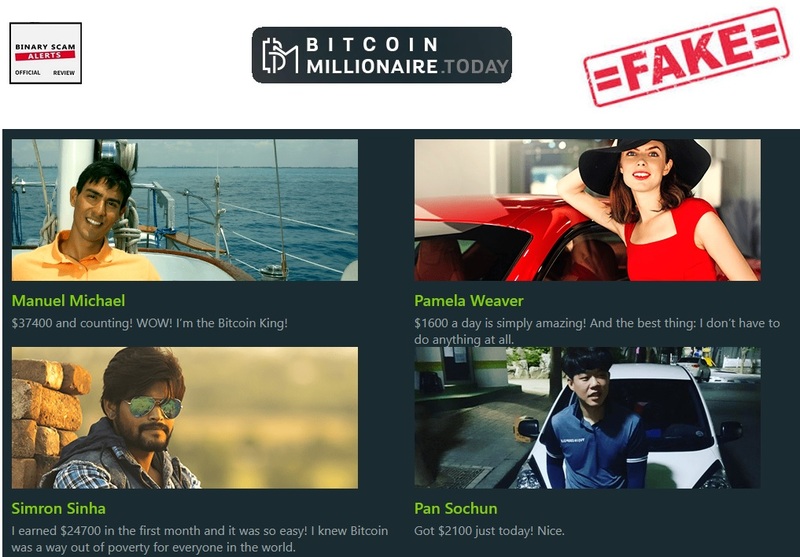 Keep reading to see how we exposed Bitcoin Millionaire and why our findings and evidence have led us to the inevitable conclusion that we are dealing with a confirmed financial SCAM. Below you will see screenshots taken directly from the Bitcoin Millionaire main sales page. Its plain to see the whole testimonial section is fake and produced with malicious intent to defraud and victimize potential day traders looking to cash in on a worthy app. As if you needed more evidence, this pattern of deception continues as blatant claims by image bank actors somehow find their way into the main members area. The images are too theatrical as most people don’t dress and look like “Pamela Weaver”. The whole script is staged by crooks and designed to trap and lure you into a web of lies about a careless lifestyle and financial independence which is “easily obtainable”. Bitcoin Millionaire Software Review – $6,273 A Day? I’m not going to sell you anything at all! OK, here we go again with the rehearsed sales pitch about putting your credit card away because you don’t need it to make profits “like this”. Victor Gray (fictitious character) will give you all the tools you need in order to make real money online, and of course it’s “free”. Then we start with Steven who explains how he lost his job and this software saved his life so now he can basically live the life he wants and do the things he loves. Gray continues to say that most systems are designed for sales only, but his system is not for sale (he is giving it to you) and he is showing us his account balance which indicated a balance of over $2.2 Million Dollars. The reason for this has to do with the fact that it makes 61.3% less losing trades then any “analogues” on the market. Bitcoin Millionaire only places trades when confident of a positive outcome of 99%. It is overtly mentioned that the wins are guaranteed and that will “not lose your money”. He claims his software is different because he only takes the “sure win”, meaning less trades but zero risk and only profitable trades. In other words it controls the risks and size of the trading positions. Don’t fall prey to this insidious new scheme. The testimonials are fake, the results are fabricated and photo shopped, the bank accounts are totally inflated, and the software is rigged and set to lose on auto-pilot. No, it’s going to cost you at least $250 to get started, and that money will be charged to your credit card by a filthy offshore broker who could care less about your financial welfare and wants to bleed you dry. We have seen a couple of them and they all want to get paid for referring clients to fraudulent software. This is a bribe for all intents and purposes and an extremely unethical business practice so watch out and stay alert because you are being targeted. The hot ones to watch out for are Bitcoin Trader and Bitcoin Loophole. Update: Bitcoin Millionaire Today is not to be confused with Bitcoin Millionaire Pro. If you are deliberating and not quite sure about which system is best for you then you are not alone. Our staff of researchers has rummaged the internet systematically while searching for the most reputable and consistent money-making apps. The result is a short list of what we consider to be the creme of the crop. These systems are all proudly showcased in our recommended section. 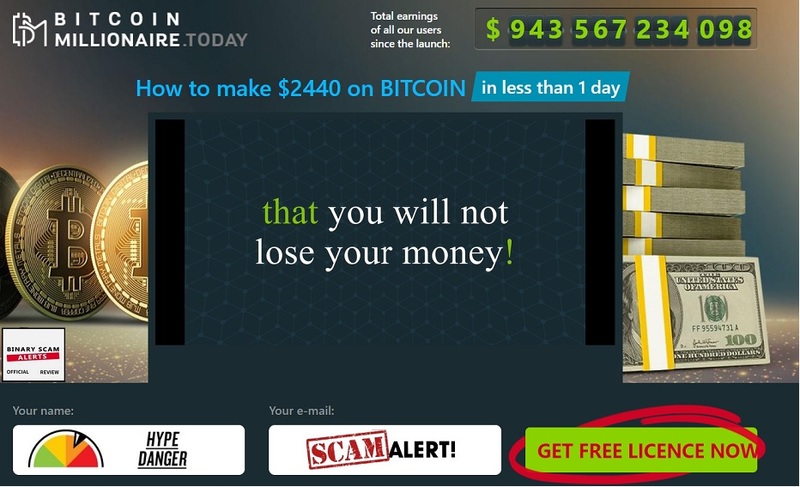 The Bitcoin Millionaire software and trading robot by Victor Gray is a verified investment scam. Our fair and impartial review provides all the required proof and evidence to validate this indisputable fact. If for some reason you have been mislead to believe Bitcoin Millionaire is legit or genuine, then you had better take a step back and consider your options because you are being led by the nose by professional charlatans and crooks. The facts have been presented to you so the choice is now yours. Don’t say we didn’t warn you about this dangerous app and don’t you dare deposit because we know for a fact this software steals money. In light of all the damning evidence which has has been produced by our staff, we are compelled yet again to BLACKLIST this fake app and advise our members and subscribers to seek alternative investment channels. As always, we would like to invite you to join our Facebook Page and YouTube channel.